Michael Margolin, D.M.D., works to help patients who are looking for more ways to get straight, white teeth. One of the options he provides is the use of veneers for teeth. As a cosmetic dentist, Dr. Margolin understands how important it can be to maintain a great smile. He helps patients in the Englewood Cliffs, New Jersey, area achieve this through a number of methods, including the use of porcelain veneers. 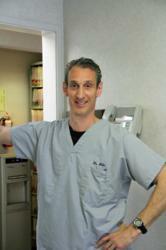 Dr. Michael Margolin suggests veneers as a cosmetic dentistry option for receiving white teeth. Dr. Michael Margolin is a cosmetic dentist who provides patients with the dental care they need and want in order to maintain a confident smile. One procedure that can be used to help patients gain straighter, white teeth is the use of veneers. Veneers can help with several dental issues that might otherwise go unaided. Veneers are usually made of very thin pieces of porcelain that are bonded directly on top of the existing teeth. The porcelain has been shaped to fit the tooth and to blend well with adjoining teeth. It can also be colored to match the surrounding natural teeth. Many people will use a whitening procedure on their natural teeth prior to having veneers done. This is so that the veneers can be matched to the white teeth that will be around them. The porcelain is very resistant to stain and reflects light in much the same way a natural tooth does. Dr. Margolin is a cosmetic dentist who understands the procedure of placing veneers, and he works to provide patients with the solutions they need to help improve their smiles. When a tooth has been chipped or damaged, the damage can be hidden through the use of veneers. Because the porcelain is shaped to order, it can be cut to give a straight line to the edge of the tooth. If a tooth has become more worn down than surrounding teeth, it doesn't look as good as the teeth it is next to. Using a veneer can help it look just like the other teeth. Sometimes teeth are discolored and do not respond to the usual teeth whitening procedures, so a veneer is used to hide that discoloration. Dr. Margolin works individually with patients who are interested in getting veneers. He evaluates patients to determine their needs. He helps them understand their options, and whether they are good candidates for the procedure. If a patient is a good candidate, the procedure can be scheduled for the patient. For more information about veneers please visit newjerseylasergumdentist.com. Margolin Dental Associates is a general practice offering patients personalized dental care Englewood Cliffs, NJ. Michael Margolin, D.M.D. received his B.A. in Economics from Ithaca College and earned a Doctor of Dental Medicine Degree from Fairleigh Dickinson University. After graduating he joined his father and his brother in a group practice where he has worked for the past 21 years. Dr. Margolin is part of one percent of dental professionals providing the most recent FDA cleared laser procedure for gum disease and periodontal treatment. To learn more about Margolin Dental Associates and their dental services visit their website at http://www.newjerseylasergumdentist.com and call (201) 399-4703.